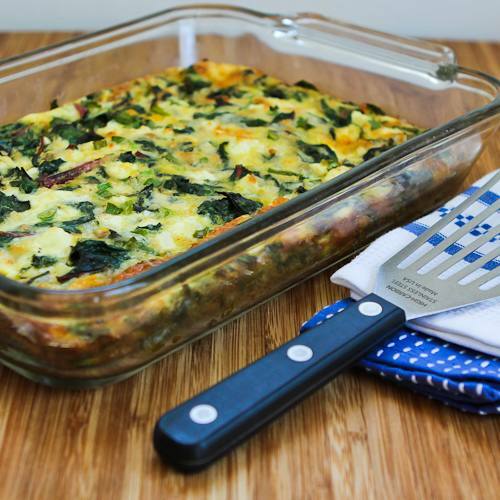 This Swiss Chard, Mozzarella, and Feta Egg Bake is a delicious way to start the day with a healthy serving of vegetables. Whether you're trying to lose weight or just trying to eat a healthy diet, you can never go wrong by eating more vegetables. A few years ago I realized one way up your daily intake of veggies was by incorporating vegetables into breakfast dishes, and since then I've come up with lots of different breakfast ideas that involve vegetables. You can use vegetables in breakfast casseroles or egg muffins, but lately I've been fond of a slightly different type of breakfast dish that I call an egg bake. This Swiss Chard, Mozzarella, and Feta Egg Bake has lots of Swiss chard with just enough egg to hold it together, and it's a delicious way to use Swiss chard.